Yann Sciberras is an artist before he is a painter. Attached to his brushes since the age of 6, he made his debut in the world of Rock-Punk music without ever being able to leave this visceral need for expression through drawing and colour. After a career as a singer and songwriter within the GROOVYTHINGZ band, he decided to devote himself entirely to it since 2010. Communicating, writing, sharing are the driving forces behind her inspiration. Witness of his time, his works recount current events, combine key words and symbols to give complete freedom to interpretations and projections. Each work is a mirror that respects everyone’s freedom of thought. 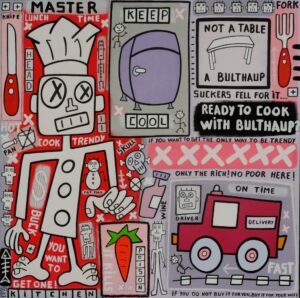 Nourished by Jean-Michel Basquiat, Jean Dubuffet and Keith Haring, Yann Sciberras has created a highly recognizable style that places him at the heart of the « free figuration » movement and in the category of so-called « actualist » artists. Yann Sciberras uses his brush to paint with strength and dynamism works that speak with power, refusing to allow indifference to take its place. It features offbeat characters, his modern-day heroes. Incisive, resolutely urban, he uses words as slogans to invite reflection and reaction on what surrounds us. His works are exhibited at the gallery DEBUT CONTEMPORARY at Notting Hill in London. In 2011 and 2012 his frescoes have been installed on line 14 of the Paris metro in partnership with the RATP. Yann Sciberras also performed for HUGO BOSS at the VOGUE FASHION NIGHT OUT in 2012 and painted a canvas for a TF1 report entitled « Retrospective in Painting » that same year, broadcast on December 31 on the 8pm news. Currently, he is participating in the 8th edition of « L’ART AU SOMMET » in Courchevel until 17 April 2017.